Creating and managing a home Wi-Fi network can be tricky, especially for those who are not tech-savvy. Though makers of Wi-Fi access points have tried to simplify their hardware setup, their gadgetry remains tricky to figure out. That goes double when you need to modify the settings of an existing wireless network – even I often forget how to pull up my access point’s admin console. Apple has made great strides in user-friendliness with its AirPort devices, but hardware from the likes of Linksys and Netgear lags in this regard. Getting the Wi-Fi network to blanket a house completely is another issue, especially larger residences with multiple floors and thick walls that create dead spots. Such range problems can be fixed with an access point that communicates with extender devices scattered about a house. But, again, setup tends not to be easy. Wi-Fi routers are often not much to look at, either, with ungainly shapes, garish colors and unsightly antennae that prevent users from positioning such a gizmo in a high and open area. 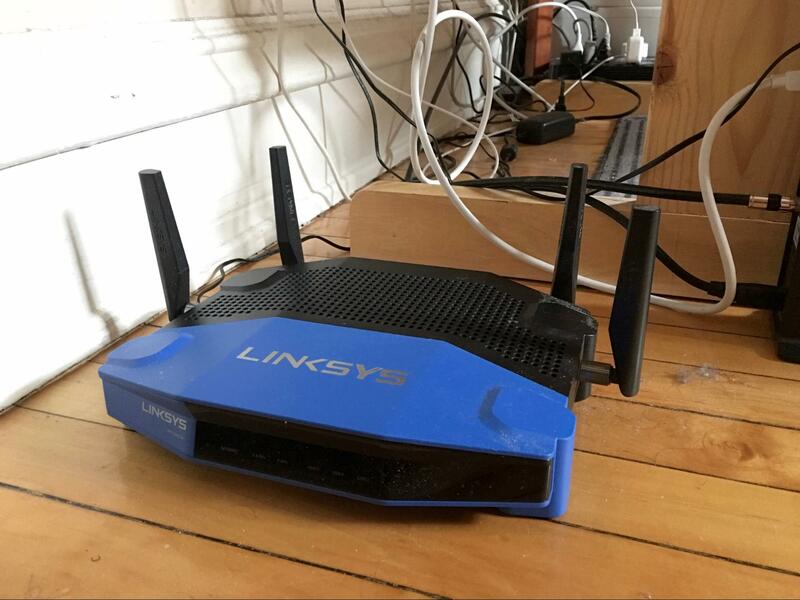 My Linksys WRT router is far from the ugliest I’ve seen, but it is still homely enough to be exiled to the floor alongside my Xfinity cable modem. Eero, a company I had not heard of until recently, is attempting to eliminate all these problems with its $200 Wi-Fi device (combining router and wireless access point functionality) of the same name. Notably, it sells Eeros in $500 three-packs for users to deploy throughout a home for better coverage. 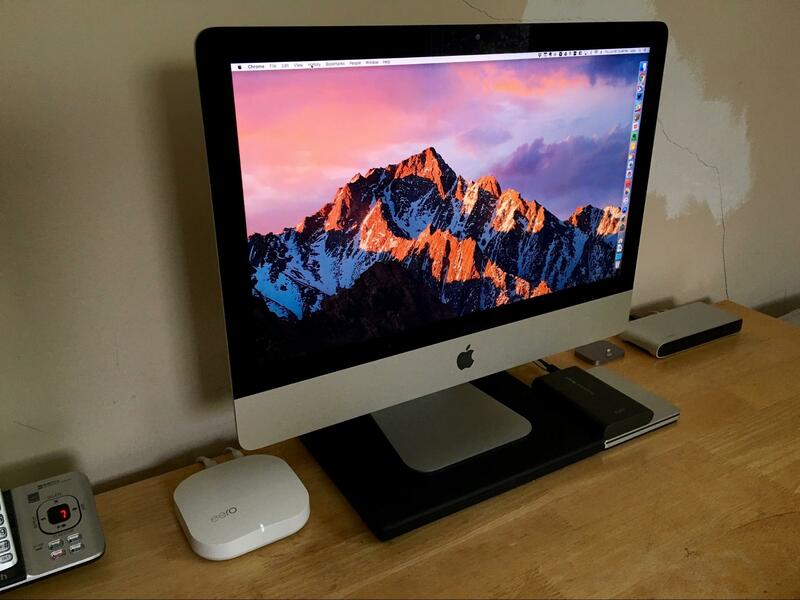 Setup is simple, and it’s easy to add more of the handsome devices if you need them. Hello, Soap Bars — There’s something distinctly Apple-esque about unpacking and handling the trio of Eero gizmos sent to me for review (I later also received a fourth). They vaguely resemble oversized bars of beauty soap. I positioned one of my Eeros atop my desk next to my Mac in my second-floor office, which I’d never do with my Linksys (but have done with reasonably attractive AirPort base stations in the past). Presto, my Wi-Fi network was up and running. 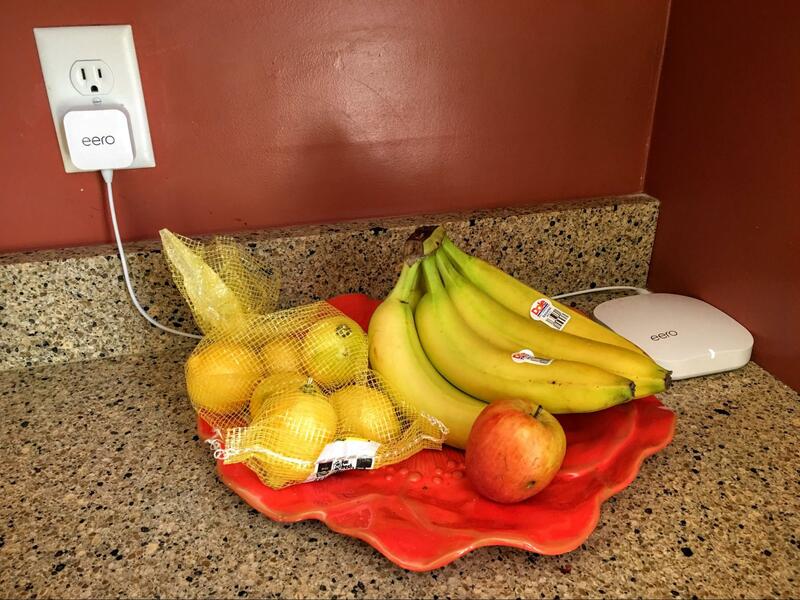 Next, I worked on positioning and configuring two additional Eero devices on my home’s first floor – one beside a fruit bowl at the far end of the kitchen counter and the other out of sight atop the living room’s entertainment center. I chose the rooms for a reason: My son uses an iMac at a kitchen workstation, while my mate is typically on her MacBook Air in her living-room easy chair, or just outside on the front porch. These Eeros needed only power. The Eero app then took me through a set of simple setup screens to configure each gadget. Though the necessary steps caused me no headaches, I did hit a few stumbling blocks. Hardware positioning was tricky, for starters. 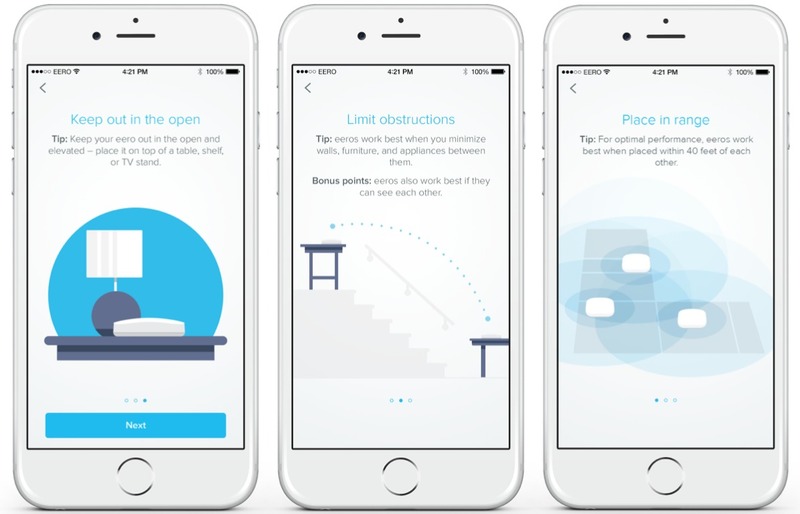 Ideally, according to Eero, the gizmos should be within 40 feet of each other and have a direct line of sight. My house is large and jumbled, though, which made such guidelines difficult to implement. Several times, the first-floor devices griped that they were not in range of their upstairs sibling, so I had to experiment a bit until I found positions they liked. I also ran into a brief, bizarre situation with the living-room Eero when its single light shone red instead of blinking blue, as it does during setup, or white, which indicates that everything is normal. A paperclip reset made things right. I set up a fourth Eero in the finished attic that my son and his chums use as a video-game lair. The Eero played a key role here: I plugged his Xbox 360 into one of the wireless device’s Ethernet ports, thereby replacing a Linksys Wi-Fi extender that is more of a hassle to use. The result was a “wireless mesh” with the four Eeros working in unison to create a wireless network across all three floors of my house. Eero takes pains to note that its devices have two radios – one to broadcast and one to receive – while many extenders have only a single radio that provides less robust performance. The device’s dual-band Wi-Fi radios handle 2.4 GHz and 5 GHz simultaneously and support the newest 802.11ac standard. Eeros, Assemble! — Once my residence was bathed in lovely bandwidth, I began running Internet speed tests. Eero’s app does this but I wanted an impartial observer, so I turned to the Ookla Speedtest app. According to Eero, it takes a bit of time for three devices to begin working properly together and provide consistent performance in the home. Even so, I got impressive results, with transfers that often approached, matched, or even exceeded what I am officially supposed to see (75 megabits per second down, per my Comcast service level, and 5 megabits up). I saw this performance everywhere, not just in the office that has a hardwired connection to the broadband modem. The Eero network fixed some longstanding wireless issues in my house. The living room had long been a bit of a dead spot, with Apple TV movie downloads that took forever, and video streaming that was buffered and pixelated. Those problems disappeared, as did problematic areas in my kitchen, though there’s one spot that seems to stymie even the Eero mesh network. My wife and kid are happier now. I don’t want to seem overly critical of the Linksys WRT router, which came pretty close to pulling off residence-wide coverage. Still, the Eero devices operating in unison are better. Cloud Creature — Wi-Fi nerds might grouse that Eero gear is light on wireless customization options, and they are right, which is precisely the point. This product is designed as a set-and-forget option for average Wi-Fi users who just want Internet access, and want it now. As Eero observes, “options on the market today feel a bit punitive by design, and overcomplicate device management.” I could not agree more. Eero’s devices, however, do have some useful extras. My Eero network includes an option to set up a secondary guest network that you can use to ensure guests (or random passers-by) can’t access devices on your primary network, and it’s easy to do this via the Eero app. You can even assign a guest network its own name and password. Eero is very much a creature of the cloud, meaning that the maker can push software updates to the device (like Nest thermostats and Tesla sedans). Such updates happen automatically, behind the scenes, when the gadgets aren’t in use and can communicate briefly with Eero’s servers. Last month, Eero added a family-friendly feature that lets users set up profiles for each member of a household. You can assign specific devices to each profile, and you can toggle Internet access to the profile manually, or it can be controlled on an automated schedule. Different devices in each profile can have different schedules, too. Firmware updates, according to Eero, are also a breeze. This is excellent news for those who have labored through the arcane procedures for updating other Wi-Fi hardware. Security updates also happen via the cloud. Eero’s cloud nature helps with troubleshooting, as well. When I was having minor difficulties with the devices, tech support was able to monitor them from afar – with my permission – to offer better assistance. Simple Gear — Eero hardware is similarly basic, with just two gigabit Ethernet ports and a USB port, along with the power port, and that reset button (which, by the way, Eero recommends not pressing unless you’re explicitly told to do so). Either Ethernet port can be used to connect to the broadband modem, while the other can be used to hardwire more hardware (like a Sonos music player or a network-attached storage device) to the network. The ports also can be used to link multiple Eeros together, or even to piggyback the hardware onto an installed Ethernet network. Speeds in such cases would often be faster than going the wireless route. Users can’t do anything with the USB port at the moment. It “is strictly used for diagnostic purposes at this time” and should not be used to plug in speakers or external hard drives, according to Eero. That’s a shame because the USB ports on other routers can be used to connect a variety of peripherals, like hard drives and printers. In fact, while on a break from writing this article, I helped a neighbor set up his AirPort Extreme with a Seagate USB drive for shared storage in his residence. A Wireless Wonder — I like Eero’s system, though with a couple of caveats. At $200 for one device or $500 for a three-pack, Eero is pricey compared to excellent access points costing $100 or less (see “Alternatives to Apple’s Wi-Fi Base Stations,” 22 December 2015). Apple’s AirPort Extreme, it should be noted, also is $200; the AirPort Express is $100, but supports only the slower 802.11n and not today’s speedy 802.11ac. Also, Eero is new, which reflexively gives me pause, though I have no major reason to complain about the gear so far, and it has garnered boffo reviews elsewhere. But if neither price or newness scares you, and you crave a dead-simple way to set up a wide-ranging Wi-Fi network, Eero is worth a look. I had WiFi problems for years with an Airport Time Capsule and Airport Express extended. I would have to restart the system every few weeks. Streaming to my audio system was horrible. Replaced with three Eeros about three months ago and except for one restart, caused by Comcast going down and so not the Eero's fault, I have had zero problems. Streaming is perfect. I'm very very happy with the Eero system. Nothing but problems with my wifi. It would work if you were no more then 50 feet away but after that, nothing. I signed up for eero back on the kickstarter phase and I waited to get it. Since I got my eero 3-pack, everything just works and it works very well. Super easy to setup and use. 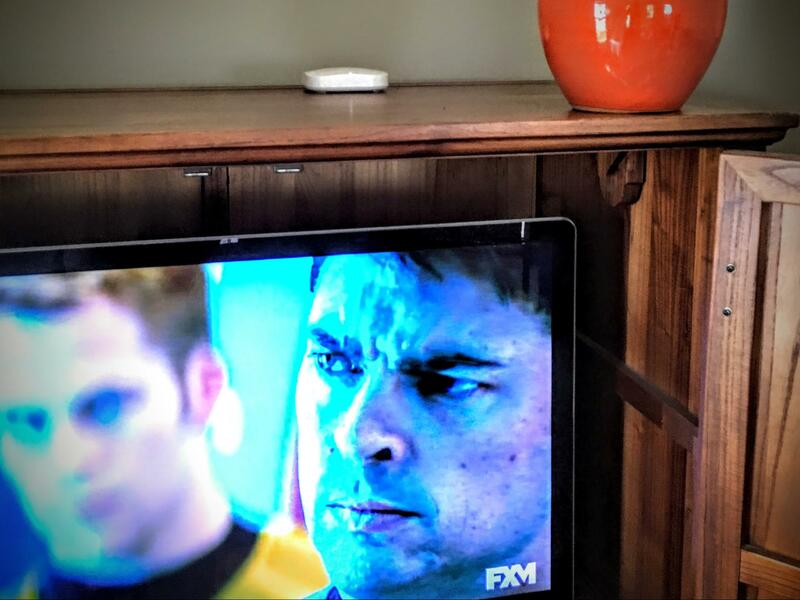 Eero updates itself in the background. Only had one minor problem but customer service took care of me in 15 minutes and it was resolved. I am a big believer in eero and I talk about eero with everyone. Are the two ethernet ports on the back WAN, LAN, or one of each?